Amazon's Kindle is certainly an interesting device, even if it's not without its faults. The e-ink screen is exceptionally good, the ability to browse and buy books wirelessly is a great feature, and the physical design is both attractive and functional. However, the lack of native PDF support, the higher price of books for international users and the lack of an effective way to sort your purchased content means the Kindle has plenty of room for improvement left. The wait is over! Australians can now finally get their hands on the much-hyped Kindle, Amazon's eBook reader. Until now it was only available in the US but it is now shipping internationally. The Amazon Kindle eBook reader boasts an excellent electronic ink display, a full QWERTY keyboard and wireless global access to Amazon's bookstore using its proprietary Whispernet network. But is this gadget worth your hard earned cash? Without doubt the most interesting and noteworthy feature of the Amazon Kindle is its display. It uses a technology called electronic paper display (EPD), otherwise called e-ink. It's a paper-like, high contrast display, making it ideal for reading books. 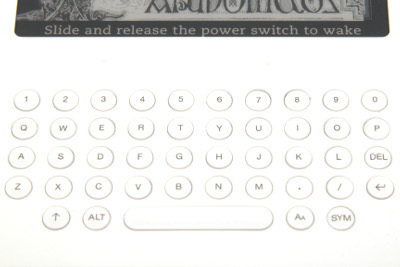 The e-ink display doesn't have a backlight so it uses far less power than a regular LCD screen, although this means you can’t read it in the dark (naturally traditional book lovers can't read books without a light either). The Kindle's e-ink screen displays text as if it’s on a piece of paper. It doesn't possess a backlight, but text is crisp, sharp and clear. 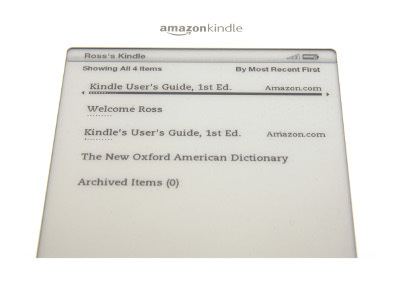 You'll be amazed when you first look at the Amazon Kindle's screen — initially it doesn’t look like a screen at all. The displayed text looks as if it's been printed onto the unit, rather than being displayed electronically. Most importantly, the text is crisp and clear with no visible aberrations and it is very easy to read. During our tests we didn’t suffer any eye strain. You can change the text size by simply pressing the button when reading e-book content. There are six text size options, and you can adjust the number of words per line to fewest, fewer or default. Aesthetically, the Amazon Kindle is a very attractive device; with its white and silver finish, you could mistakenly think this was an Apple product. In particular the rear of the Kindle has a very similar look to the earlier model iPod's — the brushed metal is attractive and the etched Amazon Kindle logo and serial number are a good imitation of Apple's style. At just 9.1mm thick, the Amazon Kindle is thinner than many magazines and certainly slimmer than most books. The slim design doesn’t make this a flimsy device: it is well built and feels like it could take some knocks. The Amazon Kindle is controlled largely via a small five-way navigational joystick on the left side of the unit. There are also dedicated page turning keys — one on either side of the Kindle that will turn to the next page, and one of the left that goes back to the previous page. The keys are well positioned and it's difficult to accidentally press them. There is also a QWERTY keyboard, which is primarily used to type in book search terms on the Kindle store Web site. It’s also useful for navigating to a specific location within a book and searching your downloaded Kindle content. 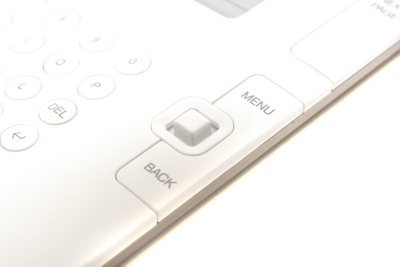 The round keys are small, yet well spaced and they provide good tactility. In our tests — we held the Kindle with our fingers on the underside like a book and typed using our thumbs — we found we had to stretch a little too far when typing, especially when pressing the keys located in the middle of the keyboard. The Amazon Kindle has 2GB of internal memory but lacks an external storage slot. It charges via a standard micro-USB connection; Amazon only includes a USB cable in the sales package and not an AC charger. Even when using Amazon Kindle at the smallest text size setting, at most you'll see two or three paragraphs on screen at a time. This simply means many more page turns than needed when reading a printed book — although this is a simple case of pressing the next page button, the screen turns black for a split second each time your turn a page (this is how the screen refreshes itself). It doesn’t sound like much of a wait, but over the course of a long book you'll be pressing the page turn button many more times than you would be turning the page of a physical book. The Amazon Kindle has a full QWERTY keyboard below its display. The round keys are small, well spaced and provide good tactility but we found we had to stretch our thumbs a little too far when typing. When you're reading a book, there are a number of operations available by pressing Menu. These include the ability to quickly jump to the cover, the table of contents or the beginning of the book. At the bottom of the screen is a handy progress bar that tells you what percentage of the book you have read. The Kindle supports "locations" — essentially virtual page numbers. A location is a fixed position in a book's text that remains the same regardless of what text size you are using. You can use the "Go to location..." tool in the menu to quickly jump to a location by typing in its number, and you can also bookmark a location. Bookmarking creates a fold in the top right corner of the page, similar looking to folding the edge of a page in a physical book. The Amazon Kindle includes access to the "Whispernet" wireless network. This is Amazon's network that uses global roaming to provide wireless access to the Kindle Store whenever you are in the coverage area. Its not known if the Kindle roams on one or multiple networks in Australia, but its pretty much irrelevant — browsing through the Kindle Store is completely free and is available almost anywhere. The Kindle's 3G speed isn't super fast, generally taking about five seconds to load a page in the store. You can browse eBooks, newspapers and magazines in the Kindle Store. Books can be viewed by categories, top sellers and editors' picks, and you can also read user reviews, see a description and try a sample of a book before you purchase. The interface looks rather like a dumbed-down version of the Amazon.com Web site. It's generally easy to navigate, but the slow page turning and browsing with the small joystick can get tedious. Books vary in cost, with most popular titles around the US$11.99 mark, though some are more expensive. As a general rule, Australian and other international users pay about 20 per cent more per book than US users; this is to cover the global roaming that Amazon provides free of charge. In addition to books, the Kindle Store has newspapers and magazines. Amazon currently supplies newspapers from multiple countries, including the US, UK, China, France, Germany and Italy, but there are no Australian newspapers available at this stage. You can obtain a free 14-day trial, following which you will be charged a monthly subscription fee. The cost varies depending on the newspaper or magazine. As an example, the UK's Daily Telegraph newspaper costs $22.99 per month or $1.49 for a single issue, while The Times magazine will set you back $2.99 per month (all pricing is in US dollars). One of the biggest disadvantages of the Amazon Kindle is that it’s a closed platform. The books you downloaded are in Amazon's proprietary AZW file format. The files are DRM protected meaning you can't transfer purchased eBooks to another user or read them on a different type of device. You can register multiple Amazon accounts to one Kindle, enabling you to share a Kindle among multiple users. The Kindle supports plain text documents (TXT) and Mobipocket books (MOBI), but lacks native PDF support. You can transfer PDF files to the Kindle by e-mailing them as attachment to your Kindle e-mail address, which converts them into a format readable by the Kindle. Amazon charges $0.10 per PDF for this service, and stresses this is for basic PDFs only — PDF files strewn with images may not show up correctly on the Kindle. We converted three PDFs: two displayed with no problems and the third appeared garbled. The lack of proper PDF support is a disadvantage, as many eBooks available on the Internet use the PDF file format. Another issue is sorting — there is no way to group your purchased content into folders for quicker access. Instead, your list of items is displayed on the home page and can be sorted only by most recent, title or author. You can also add a keyword so the book can be searched for by tag, but for users with a lot of content, this will become frustrating and tedious. 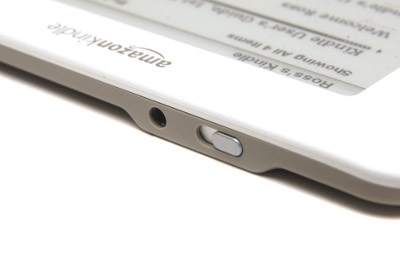 A 3.5mm headphone jack allows the Amazon Kindle to play MP3s while you read a book; it also has two built-in speakers. MP3 playback is an "experimental" feature at this stage. The Amazon Kindle also has three "experimental" features — a basic Web browser, the ability to play MP3 files while you have a book open and text-to-speech technology. International users are short changed when it comes to Web browsing — the browser only accesses Wikipedia. MP3 playback works reasonably well but there is no on-screen navigation (you use shortcut keys to control your music instead). Text-to-speech reads your content out aloud, but the voice is very computer-like and doesn't sound natural. It's also only available on selected books — Amazon allows copyright owners to decide whether to offer the feature.